I was cradling my newborn son when my husband brought the package in from the porch and opened it next to me. 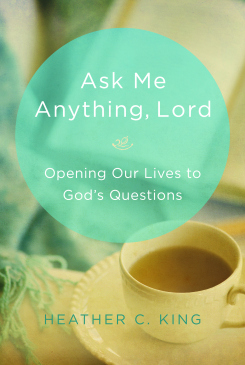 Inside was my early author’s copy of my book: Ask Me Anything, Lord: Opening Our Lives to God’s Questions. It was the first time I held it in my hands, the first time I’d seen the actual book with my own eyes instead of just a picture file sent to me by the publisher. There I sat holding two physical reminders of God’s blessing and grace in my hands: a precious baby boy and a brand new book. So, today I’m celebrating with a giveaway!!! Because joy like that you just can’t keep all to yourself! I’ll be giving away two autographed copies of the book to two different winners. You earn one entry into the giveaway for each of these things, but in order for your entry to count, you need to comment to THIS POST letting me know how you entered. If you wrote a book about your life or what God has been teaching you, what would it’s title be? Each entry needs to be a separate comment please! The individual comments are your separate entries. Entries can be posted any time between now and midnight on October 31st. I’ll announce the winners using a random number generator on next Friday’s post (11/1). I can only ship within the United States, so please keep that in mind when entering. Have you already ordered your copy of the book? That’s okay! Maybe you could win a copy to share with a friend, a women’s ministry leader, a family member or to give as a Christmas gift! Visit me at Discovery House Publishers to read a sample chapter and order online! Follow these links to find the book at Amazon, Barnes and Noble and also at Christianbook.com. You can click here to visit my Amazon Author Page. Or click here to order an autographed copy via PayPal. The book will also be available on e-readers (like nook and Kindle) and in some local Christian book stores in November 2013. And now, on to the promised weekly excerpt from my book. I hope you enjoy!!! Jacob wrestled with the Angel of the Lord all night and when the first signs of day started breaking through the darkness, “the man asked him, ‘What is your name?’” (Genesis 32:27-28, NIV). It’s such a deceptively simple question. We know our names. It’s one of the first words we learn to respond to, one of the first words we learn to write with our tiny hands gripped around a pencil and guided by our moms and dads. Who we are wrapped up in a few letters and typed up on our birth certificate and Social Security card. Sometimes, though, it’s not so easy to remember what our name is. From the time I put feet to floor and walked the tiny space between my room and my baby’s room, I had heard “mama” 62 times. It was never an upset cry or a yell, just a determined and incessant calling out for me. And in those few moments between my bed and her crib, I longingly recalled the days when my name used to be Heather. It’s as if we no longer wear nametags at events; we just post job descriptions to our shirts and that’s how people come to know us. We meet, we shake hands. They say, “So, _______, what do you do?” We answer and suddenly that’s how they know us, not by who we are, but by what we do. Nicole Johnson wrote and performed a skit about a woman who uses a label maker to define and categorize everyone around her, even to the point of hurtfulness when she labels her young daughter “fat.” Do you ever feel like your face is obscured by neon-colored labels printed out and stuck all over you by the people you meet every day? These labels oversimplify who we really are, transforming us from a dynamic person with unique feelings and thoughts into “working mom” or “stay-at-home mom,” “church-goer,” “liberal,” “conservative.” People often think they know us by the box they have placed us in. Sometimes we even forget that we aren’t defined by labels and roles and categories and boxes. Then we wake up one morning and feel like somewhere along the way, we’ve just gotten lost. God doesn’t lose sight of us, though. 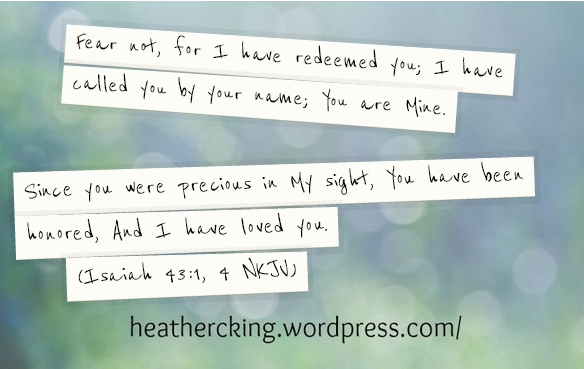 “God says, ‘Fear not, for I have redeemed you; I have called you by your name; You are Mine. . . Since you were precious in My sight, You have been honored, And I have loved you;’” (Isaiah 43:1, 4 NKJV). But Zion said, “The LORD has forsaken me, the Lord has forgotten me.” “Can a mother forget the baby at her breast and have no compassion on the child she has borne? Though she may forget, I will not forget you! See, I have engraved you on the palms of my hands” (Isaiah 49:14-16, NIV). God knew Jacob’s name. He didn’t need to ask. It’s the same with us. He knows exactly who we are and what has brought us to this place. Yet, He draws us into closer intimacy with Him by asking the question, “What is your name?” He wants to remind us that individuals matter to Him. He isn’t just a Savior who died for all humanity; He died for you and me and every other person uniquely and specifically. Taken from Ask Me Anything, Lord,© 2013 by Heather King. Used by permission of Discovery House Publishers, Grand Rapids, Michigan. 49501. All rights reserved. www.dhp.org. Posted in: Ask Me Anything, Devotions, Thoughts from my Quiet Time | Tagged: Ask Me Anything, bible study for women, Christianity, devotions, Faith, God, Jacob wrestling with angel, Lord, what is your name? Hi Heather! Thanks for the giveaway!! I think I would call my book, “Out of Wilderness” or “He who calls you is faithful”. I am not sure about a title but the book would be about how to look for the best inside yourself and others. That we should be less judgmental and more understanding towards everyone. Mine would be called Trusting God’s plan for your life and not your own. “It is ok to be ‘Not Perfect’ and not do what every one wants you to do, every time they want you to do it. I am trying very hard to, in my eyes, to not feel like I always have to be perfect. Of course I am not. I am never. But in my eyes, be NOT PERFECT. God is helping me and teaching me. Some times I don’t feel like I handel things the way HE would, but I am trying. So I really hope that one day I can be “Not Perfect” and learn to be confident. I am trying to learn to put myself first. And it is really scarry and really heard!